Digging deep into garden myths was such fun and I hope you’ll find the debunking as entertaining as these long-cherished practices. If you love great food, you have to grow these vegetables! Why Doesn’t my Endless Summer Hydrangea Bloom? Wondering why your blue hydrangea has so few flowers? How do you grow garlic? Easily! Do you think you have a black thumb? Can’t keep your plants alive? It might be a matter of changing a few simple practices. Green thumbs tell you how it’s done. What if plants could unionize? One solution for rhododendrons that have grown too large is to turn them into small trees. Think you should fertilize your lawn in April or May? If you live in the northeast or upper midwest, think again! Do you have an automatic irrigation system? We have to talk. If your plants are growing in rocks and clay, welcome to the club. There are ways of dealing with these growing conditions, however, that result in beautiful gardens. If your maple, cherry, birch, or oak foliage is being eaten in May, or if your roses, blueberry and apple leaves are disappearing, read this. The winter moth larvae are on the move. If you have a large black scab on the bottom of your tomatoes, you have blossom end rot. No worries…read on. All perennials aren’t the same…some are high-maintenance, some are picky prima donnas, and others aren’t often perennial! Here are some suggestions for reliable, low-maintenance plants. Here are some of my favorites for 2009. It’s the question I hear the most on GardenLine: How do I prune my hydrangeas? Find out here. Whether the group I’m speaking to has green or black thumbs, I aim to entertain…and get them hooked on plants. I moved to Poison Ivy Acres in 2008 and spent the summer planting, planting, planting. Here are some of my favorites from this first-year garden. Where to go when things are uncertain? To the garden of course. I’ve been planting new gardens and although I’m not making the same mistakes as in years past, I’m sure I’m making new ones. Are your petunias a leggy mess by the beginning of August? Is your hanging basket of petunias looking like it belongs in the dumpster instead of your front porch? Learn how to prevent pathetic petunias. Let’s face it: if you have a garden you will have weeds. But don’t despair – there are ways to keep them to a minimum! Why should we encourage people to get into their gardens? How is gardening important to you? You don’t have to plant a huge garden to enjoy home grown vegetables and fruit…learn how to include edibles in your landscape. Choosing the right foundation plants to soften the hard edges of your house. Be it a houseplant, outdoor pot of annuals, or even a small, containerized tree, the guidelines for watering are the same. When it comes to buying fertilizer, it helps to understand the numbers on the package. Find out why you don’t have to cut the old daffodil flowers off when they finish blooming. How to grow a living Easter basket or charming spring centerpiece: an easy plant project for all ages. Some perennial plants are more reliable than others…find out why! There is nothing as good as a homegrown tomato, and the success of your tomato crop depends on paying attention to the soil. To loosen the roots or to leave them alone…that is the question! When planting your containers and window boxes in the spring, do you really have to use new soil? Be adventurous and thrifty by saving seeds from your garden. Adding a vertical element to your garden is an easy weekend project. How to create a fun and functional ornament for your landscape. 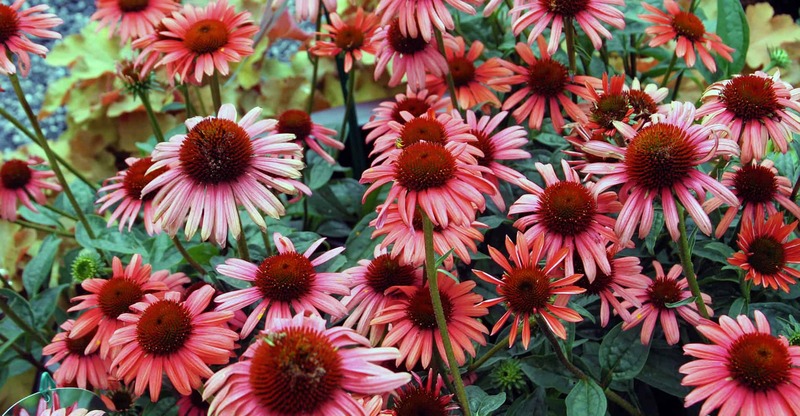 Do you really have to cut off wilting flowers on your perennial plants? The pros and cons of deadheading. If you’ve ever looked at a packet of tomato seeds or the tag on a flat of tomato seedlings, you may have wondered about that string of letters after the name. VFNA…what could it mean? Some general tips for success with these long-flowering plants. Some plants are well-behaved, and some are thugs! Dealing with over-enthusiastic growers. You say you don’t want to fuss with a compost pile? Take those kitchen scraps right to the garden! Why garlic and red pepper belong in the garden shed as well as in the kitchen. You say you want to grow plants from seed but you don’t have a sunny window? They bloom in the winter, they smell nice, and best of all, they’re easy! You can have beautiful, healthy plants even if you don’t have a green thumb: some tips for success with houseplants. Gardeners are more likely to relish the coming of winter, I think. My thoughts on welcoming the snowy season. New flower beds and vegetable gardens don’t have to start with tilling the soil…learn about an easier way. We gardeners can be an impatient lot: we often want our gardens to be glorious from day one. Our plants, however, often have a different agenda. Looking for lest-toxic insect and disease control? Start with a summer-weight oil. Why the acidity, or alkalinity of your soil is important to you and your plants. When you go to nursery to buy plants, which should you choose? The largest ones? The ones that are in bloom? This article helps you to pick healthy, robust plants. I love these plants! I want to plant them again! A review of the new and tried-and true, 2004.